Felix the Cat by Hudson Soft. Felix The Cat is a video game released in 1992 for the Nintendo Entertainment System and in 1993 for the Game Boy, published and developed by Hudson Soft. It is based on the cartoon character Felix the Cat. A look at (some of) Felix the Cat – with Sharon! The challenge continues all the time. 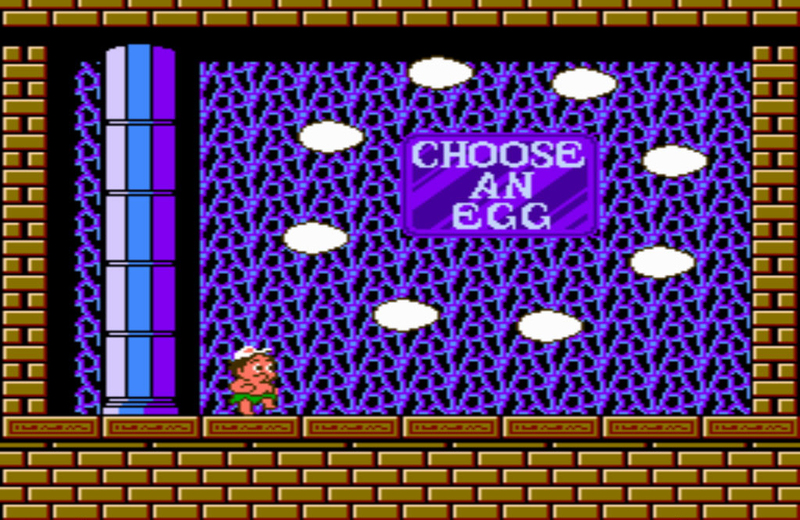 Submit your pick for the NES challenge in the comments below. The year was 1991. As a gleefully naive eleven year old, I wonder what ‘war’ really means while I follow the news regarding turmoil in Iraq. The shortcuts on my computer take me to Lemmings, Hugo, and my favorite of that year, Duke Nukem. While the family nintendo enjoys a useful rotation between my brother, myself, and our friends, having a computer in my room at eleven years of age (and honestly even long before that) means uninterrupted game time. The result of my indifference to consoles at the time made for many missed hours of game play with popular NES titles. In my NES challenge I intend to take a look back at the titles I missed. Some games good, others not, but all having a place as “a bit of gaming history that I missed”. 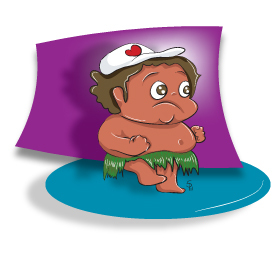 Adventure Island II was developed and published by Hudson Soft and made release on the Nintendo Entertainment System and Game Boy in February of 1991. 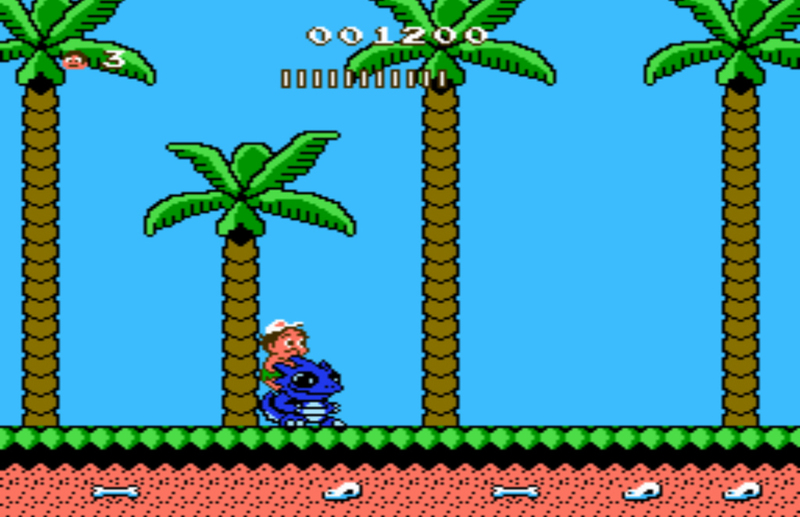 The story is aparantly one in which we find Master Higgins, a tropical villager who is trying to save his girlfriend from the aliens that are invading places surrounding Adventure Island; he is aided by skateboards, dinosaurs, and axes. Unsurprisingly very little of this story was apparent to me as I played the game. 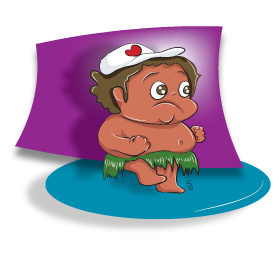 The Characters: While Master Higgins himself is an endearingly chubby little fella, he can really book it when he needs to. The only thing that made me smile more than his era appropriate skateboarding was the dinosaur helpers he encounters along the way. Yes I may be somewhat guilty of already being partial to dinosaurs but these colorful dinos have the biggest eyes and goofiest grins and I just love it! After reflecting upon my time playing I found that I had inadvertently collected screen-grabs containing the friendly dinos almost exclusively. Water levels: If you know me then it will come as no shock to you when I say that nothing beats a great side scrolling water level. 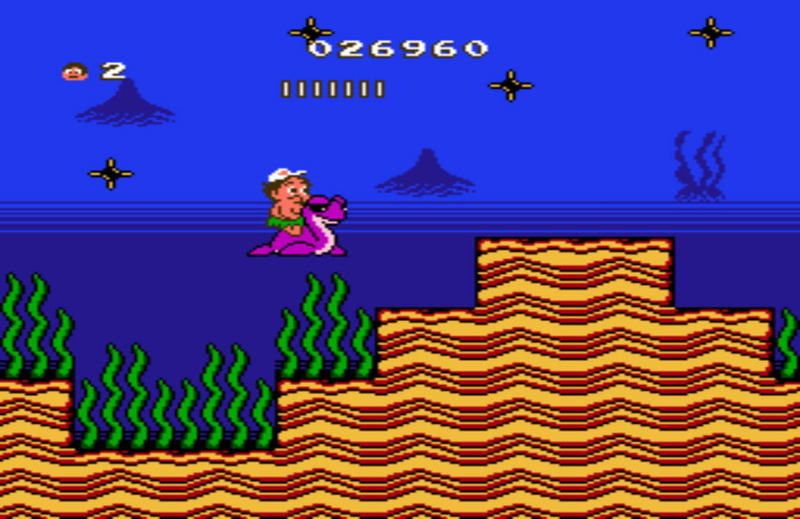 Adventure Island II has plenty! Seaweed, bombs, jellyfish, nor-whales (i think), and crazy encapsulating bubbles all proved to make my water levels that much more exciting! The music: Yes, this challenge is, in part, an attempt to become more familiar with awesome game music that I may have missed from ‘the good old days’. Because my mind has now been opened to this element of game play I have become much more aware of when these funny little tunes get stuck in my head. Whether my enjoyment of the Adventure Island II melodies is because this game is my first in the challenge or not, I can’t say for sure, but I did find myself humming along. I am okay with this result. The weapons: Don’t get me wrong, the axe is cute! What I wished for was a slightly larger variety of weaponry. Let’s face it, I am fighting against a myriad of jungle creatures all with different offense and unless I am able to utilize the tail whip of my adorable buggy eyed dino, the axe is all i have. Level End Prize Egg: I have to assume that not all the eggs in the egg rotation that occurs at the end of each level contains a measly 100pts but no matter my strategy that is all I was ever able to obtain. As I played through the game I approached each level with different strategies. At first I made an attempt to kill everything in sight. Later levels had me attempt avoidance at all costs. I took my time, I raced through, I considered all possible ways to play the game. And in the end my success rates were about the same. My first venture into the vast pool of gaming experiences that I missed was an enjoyable one. While the game will never be one of my top ten I did truly enjoy my time with Master Higgins and knowing that there were more iterations to follow is a good thing. 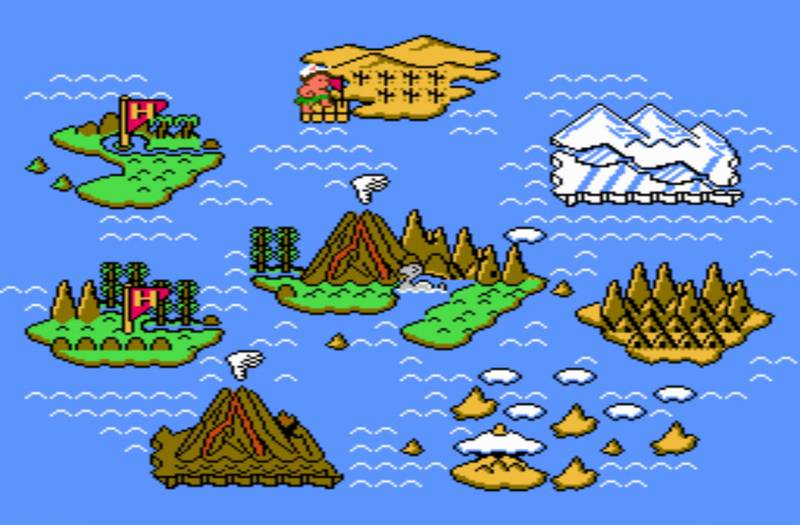 More Adventure Island means more chances for me to see how the franchise developed and whether or not it really is one of the more substantial pieces of game history that just happen to be clouded by my interest in other areas. Now that the first game in The NES Challenge has wrapped up it is time to look forward. I wonder what will be next….